First of all let me give you a brief summary of the beginning of the story. One morning in Topeka, Kansas, a strange visitor named Travis Boyette comes to the office of a Lutheran minister Keith Schroeder. This frail man turns out to be a paroled convict with a long record of sexual assaults in various states. Travis confesses that he is guilty of murder of a high school cheer-leader, Nicole Yarber, that took place 9 years ago in the small East Texas city of Slone. A black 18 year-old local football star, Donté Drumm, was wrongly convicted and sentenced to death. Only four days are left before he is to be executed. And now some words about my personal impressions of the book. To say the truth, the book hasn’t fully met my expectations; however, it hasn’t disappointed me either. I was attracted by the gripping plot and the important social issues the novel deals with. I liked the representation and psychological descriptions of the central characters, which were quite realistic and believable. 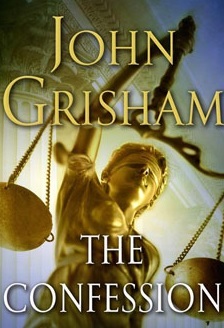 I think Grisham succeeded in capturing the atmosphere of the situations and the events he depicted. For example, the description of the working atmosphere in a legal firm meeting a deadline was very convincing, as well as quite a few other scenes. It was also interesting for me to know some details about legal procedures in the US, and I also learnt, or recalled, some facts related to American society. On the whole, I would characterize this book as an easy read that allowed me to practice English in a relaxed way, without having to make a frequent use of a dictionary. However, I found the language and the style of the book a bit too simple, and its vocabulary somewhat limited. Therefore, the book was of little literary value for me. I have also got the impression that the novel is slightly unbalanced as for the structure, and its second half had some heavy going pieces. Instead, I would rather the author gave more details concerning other matters, which he actually left undeveloped. P.S. Any comment or correction will be appreciated. Словарь юридических терминов на русском-английском- испанском? Это любопытно!